Does Anyone Care If a Child is Sacrificed for CPS to SAVE FACE? Remember Katie Wernecke? Well, I did as her dad requested and wrote my representatives. I also wrote to some church leaders who are nationally televised, and to the President. I made sure that everyone who got the letter saw the list of names on the bottom which I was sending it to. In case you are just joining in on the Katie case, you can read the details here: Katie Wernecke Case Summary (this post is also available on Katie's Blog as well as current updates from her family). I got a response back from one senator (Democrat) who asked me to fill out some paperwork before she would talk to me any further on the case because of privacy laws. I got a letter back from another senator (Republican) thanking me for sending me a copy of the letter I wrote to President Bush - with no other remarks. I then got a letter from Tom Craddick at the Texas House of Representatives (he is the Speaker) that seriously disturbed me as a Texas Citizen. Thank you for taking the time to write me regarding Katie Wernecke. Your concern for Katie and her family is greatly appreciated. My office is closely monitoring the actions that Child Protective Services (CPS) takes in this case. As you are aware, this widely publicized case is rapidly developing. 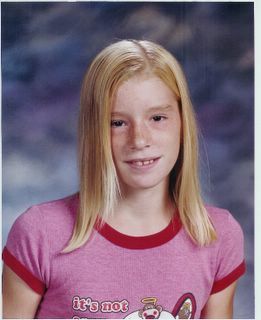 On June 16, 2005, the court ruled that Katie is to remain in foster care while she receives treatment for her cancer. The court will reassess the situation very soon. Until then, Katie will remain in CPS care and receive immediate medical treatment per the recommendation of her team of doctors. Child Protective Services has informed us that every effort will be made to include Katie's parents in her medical care, including their attending her appointments and treatments. The ultimate goal of CPS is to reunite a healthy Katie with her family. Thank you, again, for writing. Please feel free to contact my office if we can be of further assistance. CPS's goal is to reunite a healthy Katie with her family? Since when was it the STATE'S RESPONSIBILITY TO ENSURE YOUR CHILDREN'S HEALTH? I thought we were a free country where parents raised their children in the manner they see fit, and have ultimate control over the family's medical choices? Since I last wrote about Katie on my blog, CPS has mysteriously produced what they claim as proof that Katie still has cancer (after six tests and an un-necessary surgery to remove her thymus gland). They showed the parents one slide with four cells that had an extra nucleus and told them that 90% of what was removed had been proven to have Hodgkin's. Although on the slide, there were hundreds of normal cells, and it was the only slide provided. They also have lied about meeting times and included people in the meetings that are not privileged to have Katie's medical information. They have put Katie in a home with seven other children while she is enduring chemo treatments, and the more exposure to germs you have during Chemo, the better your chance of infection is. CPS chose a drug that would sterilize Katie even though they had been requested by Katie and her father that they use a safer chemo treatment because she hoped to have children as an adult. CPS has not allowed Katie proper healing time to recover from surgery before they started their harsh chemo treatment plan. They chose a treatment plan that would drag on for six months depending on her ability to handle it (and she has not been able to handle the chemo well so far). She will have to be separated from her friends and family for this unbelievably long period of time and forced to go to school in Houston during this time at foster home. Katie was allowed to get dehydrated because of lack of IV fluids by CPS after her treatments while in foster care... which is what we call MEDICAL NEGLECT (the same thing they took Katie from her parents for). CPS has repeatedly denied visitation and religious rights to Katie and her family. They have refused to give medical information to Katie's family, even in a time of crisis regarding her blood count being dangerously low - and she has had to receive blood transfusions again from the public blood supply even though her mother has offered to donate blood for Katie. The list goes on and on if you read her updates on the Pray for Katie blog. Does this sound like "care" that CPS is providing? Does it sound like "every effort" is being made to include Katie's parents? I don't care WHAT CPS's ULTIMATE GOAL IS. THEY DON'T HAVE THE RIGHT TO KEEP KATIE WERNECKE FROM HER FAMILY OR DO ANYTHING MEDICALLY TO HER!!!! And YES - I AM SHOUTING! I hope they take all these people involved in this case DOWN over this. Especially the doctors and CPS cronies. These people need to be shipped to Guantanamo. I agree that CPS has again stepped way overbounds on Katie's case. We have some friends that had to go through the CPS system due to no fault of their own but a fluke accident. CPS is not willing to work with family or friends everything is according to their rules which are often not logical. Even if their is no previous neglect or cause for concern,and numerous character wittnesses to your parenting skills and even having outside positive evalations by professionals will not get your kids back. If a family member or church member is willing to take in the child or children until the situation is worked out CPS will usually refuse wanting the kids to go to foster care of their choice. My friends case turned out fine and was dismissed but only after many many months of waiting, taking classes on parenting and living without your kids. This is trama that the children will always remember. I believe that there will be a sad day in our country when we will be jailed and our children taken away from us just because we chose to spank our own children. God has given us our children to care for and He gives the parents wisdom regarding the medical care of their children not CPS. If this makes your "blood boil' then please help us fight CPS to return Katie to her parents. The separation, heartbreak, dispair, and emotional truama Katie is going through is enough to kill her with out all the life threatening chemo treatments she is being forced to undergo. CPS has told so many lies in the press and media even the Speaker of the House believes them. Are your kids next? We have got to put a stop to this out of control CPS agency. Write and call your Texas state representatives, especially the Speaker of the House, the Texas Senate, and the Governor of Texas. You can find some prewritten letters at http://www.compassionchildren.org/katie.htm. Your own words or experiences are better, but use the letters as a starting point. Donations are also needed. Use the links at the right of this blog or go to http://www.compassionchildren.org. You may email Katie or the family with the link at the right of the blog. Keep praying for Katie. Because of your prayers she didn't get the blood transfusion; at the last minute her blood counts were going up. Pray for her protection from the damaging chemo treatments. God Bless You All.